Jerusalem District Planning and Building Committee says permit to work on expanded egalitarian section has expired, new request necessary. 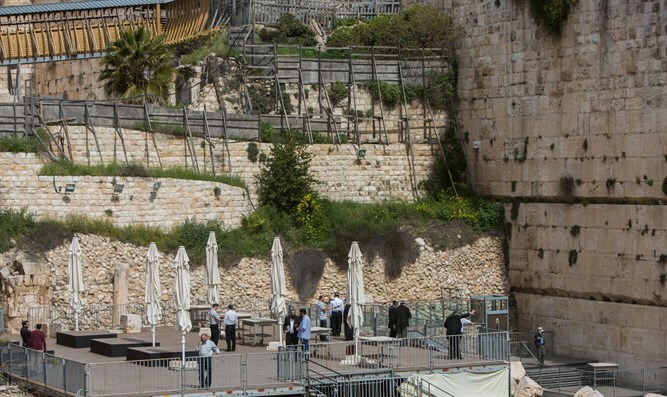 A new document issued by Deputy Jerusalem Municipality Attorney Ze'ev Gabai at the District Planning and Building Committee states that the building project in the southern square of the Western Wall cannot be approved and that the request should be rejected. This document means that from a legal point of view it is impossible to continue advancing the plan to expand the egalitarian prayer section at the Western Wall in the District Committee, and a new planning process should be initiated and a new request must be made. The document states that the Jerusalem Municipality and the local licensing authority believe that it is impossible to renew the permit for expansion because it has already expired and no work has begun on the ground. "Accordingly, the date on which it is possible to renew it is past," the document says. "As explained in the letter of the Director of the Licensing and Supervision Department, Mr. Ofir May, dated December 3, 2018, the actual construction does not conform to the building permit and the applicants for the permit in meetings with the municipal engineer and his team, declared that they intend to work on a different plan than that allowed by the permit (construction in accordance with an architectural plan to improve accessibility that requires the issuance of a separate building permit)," The document also stated that the municipality's position is consistent with the position of the new mayor, Moshe Leon. Prime Minister Netanyahu, through his representative on the committee, is currently seeking to advance the approval of the building, but it is possible that the committee, which is conducting its deliberations behind closed doors, will be forced not to allow the continuation of work there.